Let’s ring in the New Year with some chocolate! Bouchon is the French term for a type of restaurant found in the region of Lyon. These places are known for wonderfully rustic, robust, lusty meals prepared and presented in a simple and warm atmosphere. They are places where local wares and ingredients are shared at an open table in the best of the communal spirit. 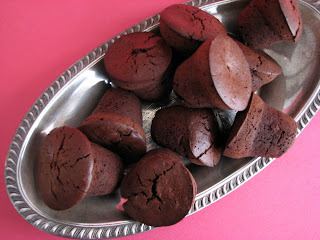 Bouchon is also the French word for “cork” and is perfectly applied to the little French chocolate cakes that are baked to resemble the shape of a cork. So it is fitting to celebrate New Year’s Eve by sharing a bouchon with those you love. Or those you want to love. These cakes take just a few moments to mix and another few minutes to bake. 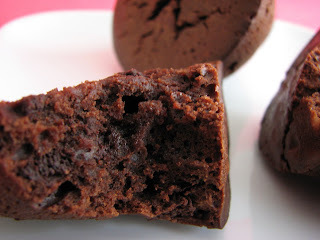 They are cakey but also a bit fudgy, with a crunchy-chewy exterior – a sort of Frenchy brownie but not as rich or cloying. My recipe is decidedly not overly sweet in an effort to emphasize the glories of the main ingredient. If you love chocolate, this is your roadmap to a quick fix. Voila. 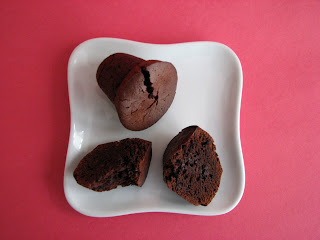 - While I usually favor Dutched cocoa by Valrhona, I’ve made this recipe with both Dutched and unDutched cocoa and both are great. - I baked these bouchon in 2” cylindrical timbales, each holding about 1/3 C batter (or roughly 1 1/2 oz). They took about 24 minutes to bake. Adjust your baking time depending on your baking tins and the vagaries of your oven. You can use a mini-muffin tin if you have one of those. I’ve also seen mini-popover pans used and they make gorgeous bouchon. In any case, start checking your bouchon around the 15 minute-mark. An inserted toothpick should come out with a moist crumb. Nothing worse than dry cake and the difference between perfect cake and dry cake is less than 2 minutes. Keep checking every couple of minutes once you get to the 15-minute mark! - These are best eaten the same day but can be stored in an airtight container for a couple of days. Preheat oven to 350 degrees. Butter 2” timbale molds and place on a sheet pan. Melt chocolate and butter over a water bath or bain marie and stir to blend. Whisk the eggs, sugar and salt together and add vanilla. Add chocolate to egg mixture and stir until smooth. Whisk together the flour and the cocoa and add to the chocolate mixture, stirring just until it is nearly blended. Add the chopped chocolate and stir until blended. Spoon batter into molds, filling them to the top. Bake for 20 to 24 minutes, but start checking around the 15-minute mark, depending on the size of your baking tins. A toothpick inserted into the bouchon should come out with some moist crumbs. Cool briefly and remove from molds. And with that…..
2007 has been an incredible year for me. I’ve worked with people who inspire me in countless ways. I’ve enjoyed great humor, wisdom and lots of new ideas. I’ve joined causes that have lifted me up and introduced me to a whole new world that reinforces the strength and generosity of the human spirit. I have learned so much from every endeavor and encounter. I hope you also savor some great memories from the year’s many activities and moments of quiet pleasure. Let's now turn to a new year filled with a fresh excitement for everything life has to offer. This blog is one way I share my passion and curiosity for the beauty of the culinary world. I hope you have enjoyed it as much as I have. Special thanks to everyone who taste-tested countless bites and proved once again that good food is the universal language of the gods. And a very special note of appreciation to all who supported pastrystudio from its very inception. My deepest gratitude for your love, advice and encouragement. Be it resolved to have only the most delicious morsels in your life! Panforte is a dense chewy confection made with honey, nuts, spice and candied citrus with origins dating back to the Middle Ages in Siena, Italy. It was once used as a tithe to the monasteries at the beginning of each new year, so you will often find it in abundance throughout Italy at this time of year. Each regional shop carries its own distinctive brand. Some say a proper panforte should have 17 ingredients to reflect the 17 different contrade, or city subdivisions, within the city walls. The most famous contrade are the 17 Contrade de Siena that form the teams of the Palio di Siena. As new ingredients were discovered over the centuries, many different recipes for panforte evolved throughout the regions. The Parenti bakery developed a chocolate one in the 1820’s. 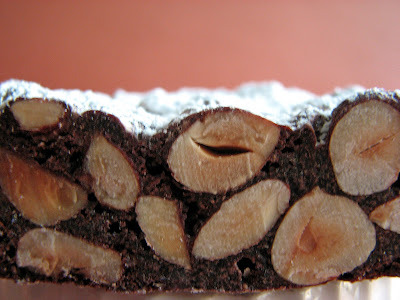 There are now three principal varieties, Panforte Margherita, a lighter and sweeter version named after Queen Margherita; Panforte Nero, made with an emphasis on bitter almonds; and my favorite, Panforte Panpepato, typically the highly spiced version that comes from 13th century Siena. - You will need a candy thermometer or be able to test for the softball stage (240 degrees). - I candy Buddha’s Hand each year for panforte. It is an essential ingredient! The unique aroma and flavor will knock you out. And, no! It bears no resemblance to those icky fruits you see in plastic containers! Buddha’s Hand or citron can sometimes be found at farmer’s markets or specialty markets. In an absolute pinch, you can use candied lemon peel. - I added a pinch of cardamom to the recipe because I just had to. - You can also bake in eight 3 1/2” tartlet pans for individual gifts. 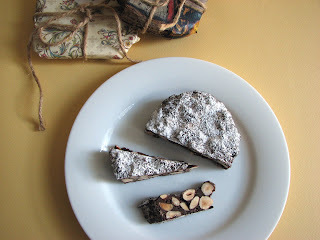 - Traditionally, panforte is baked on a piece of edible wafer paper to make removal from the pan a bit easier. I use butter and cocoa as stated in the recipe. The trick is to remove from the pan while it is still warm. But if you wish to remain true to tradition, you can order wafer paper online. - Enjoy with a good cup of coffee or a little glass of vin santo. Prepare a 9 1/2" springform pan with butter. Dust with 2 teaspoons of cocoa, tapping out the excess. Preheat your oven to 300 degrees. Chop chocolate into small pieces and melt in a bowl set over simmering water. Be sure the bowl is not touching the water. Chop the nuts coarsely but leave a few whole. Stir together nuts, flour, 5 tablespoons cocoa, candied citrus and spices in a large mixing bowl. Attach a candy thermometer to a small heavy saucepan. Place granulated sugar and honey in the pan and heat to 240 degrees F.
Mix melted chocolate into nut, fruit and spice mixture. Stir in honey syrup. Work very quickly because the batter will begin to stiffen very rapidly. Transfer batter to prepared pan. Dampen your fingers or the back of a spoon with a bit of water and spread batter evenly, smoothing the surface. Bake for 50 minutes and cool for about 30 minutes. While still warm, loosen the edges from the pan with a thin knife. Remove from pan with the help of a metal pastry spatula, if necessary. When cooled completely, rub powdered sugar into the top and sides of the panforte with your hands. Panforte improves with age and will keep up to one year wrapped and packed away in a cool dry place for your journey to the New World. When you open the container, you will be completely blown away by the absolutely other-worldly fragrance of panforte. Buen appetito! 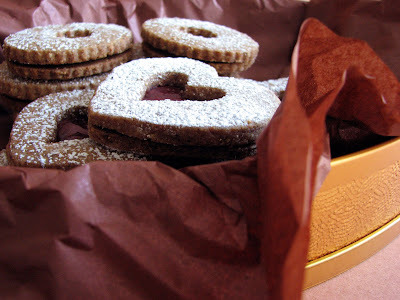 In an appreciative bow to tradition, what would the season be without Linzer Cookies? These crisp spicy cookies filled with jam are a mini permutation of the Linzertorte, the oldest known torte that originates from the city of Linz in Austria. The first recorded recipe for the Linzertorte dates back to 1653 and comes from the archive of the Benedictine monastery Admont Abbey, renowned for its Baroque architecture and its vast library and art collection. The basics of the Linzertorte are very simple: a thin layer of nut pastry filled with jam and then topped with a criss-cross lattice of nut pastry. The torte is most often filled with raspberry or red currant jam, but apricot is another favorite. The modern version is a sandwich cookie with the same elements. This cookie is an easy mix that combines the earthy crunch of hazelnuts, the warmth of aromatic spice and the lusciousness of fruit all in one bite. Once you begin the baking process, the smell of roasting nuts and spices emanating from your oven will surely send you into a state of delight powerful enough to soothe any holiday angst. A light dusting of confectioner’s sugar on top reminds us of the snow-filled fairy tales that include our favorite fantasies. Take it to the next level by dipping a portion of each cookie in melted bittersweet chocolate and you have the dreamiest cookie in your midst. Resistance is futile! Linzer Cookies showcase the best pastry traditions of Austria and will remind you just how easy it is to join in this season of giving. Share these delicious old fashioned cookies with your guests as they gather to celebrate the warmth of your table. - The secret to well shaped crisp cookies is chilling. Lots of chilling! Once the dough is mixed, roll it out to 1/8” and chill it so that it’s firm enough to make the job of using a cookie cutter a snap and so your cut cookies maintain their shape. Once cut, chill them again to be sure they hold their shape during baking. - I added an egg yolk to the original recipe for added richness and tenderness. I also left out the almond extract and added a teaspoon of rum for a bit of holiday cheer as well as a pinch of freshly grated nutmeg. 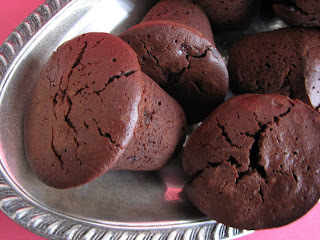 - Unfilled, these cookies will store a couple of weeks in an airtight container. As with all pastries that contain a good measure of spice, they taste best the next day when all that goodness has a chance to co-mingle and become an even greater temptation. - When cutting out cookies, handle the scraps gently and reroll. - My cookies took about 17 minutes to bake. The test for doneness for most cookies is if they move easily when gently nudged. If they show any resistance, bake another minute. Place the flour, nuts, sugar, salt, spices and zest in the bowl of a food processor. Pulse until the mixture is finely ground. Add the pieces of butter, extract and/or rum and egg yolk if using and pulse until the mixture has a damp appearance and starts to clump around the center of the bowl. Remove the mixture and gather into a ball, gently kneading a bit if necessary to bring the dough together. Divide into two packets and using two pieces of plastic wrap for each packet, roll out to 1/8” thickness. Place on a sheet pan or flat surface and chill until firm, preferably overnight. Using your favorite cookie cutter or a thin sharp knife for simple geometric shapes, cut out the cookies and place on a parchment lined pan. If you have a smaller version of your cookie cutter, cut out a center on half the cookies so the color of the jam can shine through. If the dough has softened at all, refrigerate again until firm. Preheat oven to 325 degrees. Bake the cookies in the upper and lower third of the oven for about 13 – 15 minutes, rotating front to back and top to bottom half-way through the baking. The cookies should just start to take on a little color around the edges. The smaller cutout centers will only take 8 – 10 minutes. Cool cookies completely before filling or storing. 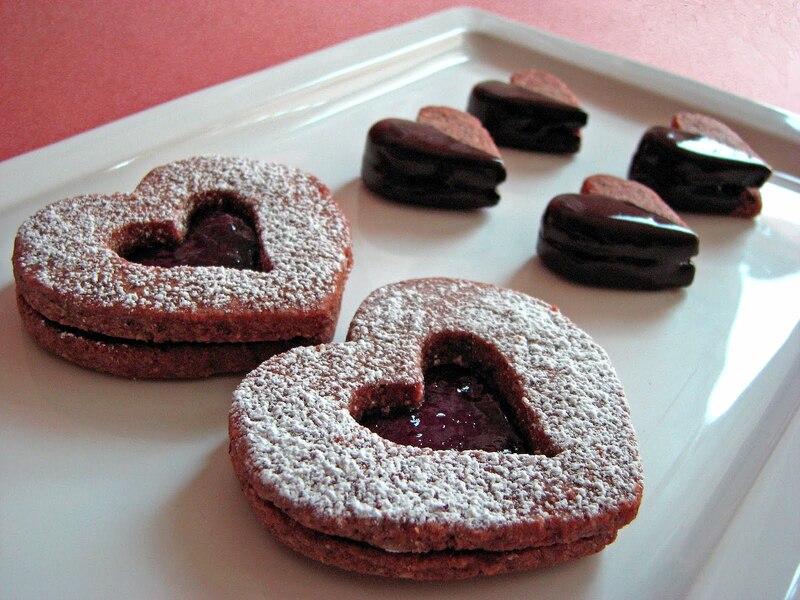 Dust the cookie tops with confectioner’s sugar, put a thin layer of preserves on the bottoms and sandwich together. 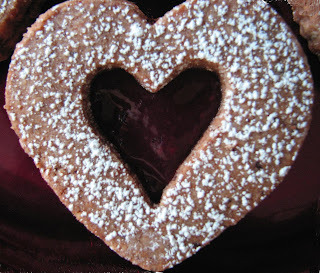 If desired, skip the dusting of sugar, melt a bit of bittersweet chocolate and decorate as you wish. 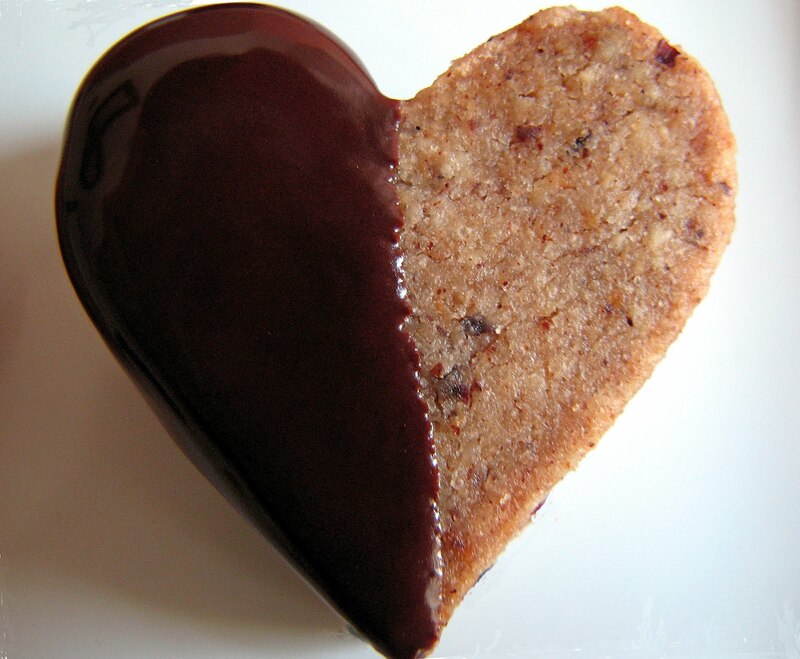 If you have not cut out a window, you can dip a portion of the cookie into the chocolate, scraping off the excess from the bottom and placing on a cooling rack or piece of parchment to dry. If you have a cut out on the cookie top, you can simply drizzle some chocolate across the surface. If you’ve never had a bowl of fresh quince in your kitchen, you probably haven’t experienced the most floral winter fruit fragrance imaginable. As they continue to ripen, they fill the room with an almost tropical aroma. With their lumpy exterior and gnarled shape, quince are often thought of as apple’s ugly cousin. They have a form similar to an apple and the texture of a hard pear, but caution! They are not to be eaten raw. They are very hard, bitter and astringent and that is definitely not the way to be introduced to these gems. However, once they’ve been cooked in a nice poaching liquid they truly are a lovely and unusual treat. Although quince have a yellowish green surface with an ivory interior, the poaching process transforms them into a deep rosy orange, which may account for some of their mystery. They do take some work before you can coax them into a palatable pleasure, but it is worth every minute to get there. Brimming with natural pectin, quinces are perfect for making jams, jellies and membrillo, the Spanish fruit paste often served with Manchego cheese. Quinces are also a staple in savory Moroccan tagines, North African and Middle Eastern stews, Chinese teas and Hindu chutneys. The cultivation of quince likely originated in Mesopotamia, somewhere between the Caspian and the Black Seas. They also appear in ancient Greek writings and were thought to be the favorite of Aphrodite, which made them a ritual offering in wedding ceremonies. Charlemagne also introduced the fruit to France and they are mentioned for the first time in the English language in the later part of the 13th Century. By the early 18th Century, quinces had found their way through the Massachusetts Bay and on to Virginia. 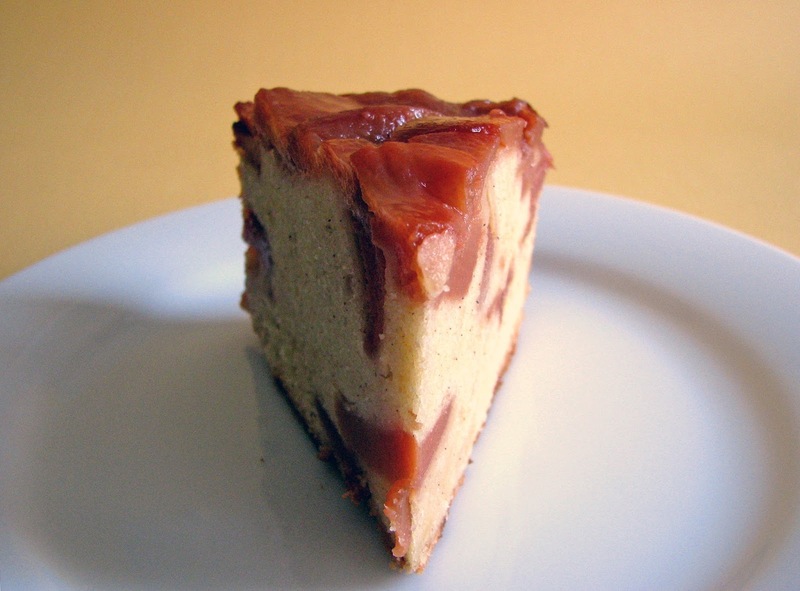 Knowing my love of quince, a friend recently sent me a recipe for Quince Pound Cake from Epicurious. Since I'm definitely intrigued by anything having to do with fresh fruit, I was game to try it and I'm glad I did. 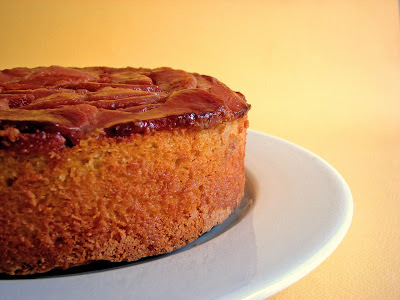 The combination of the cake, with its almost imperceptible yet fabulous hint of spice, and the mildly sweet flavor of the fruit make this a great way to enjoy the brief quince season. 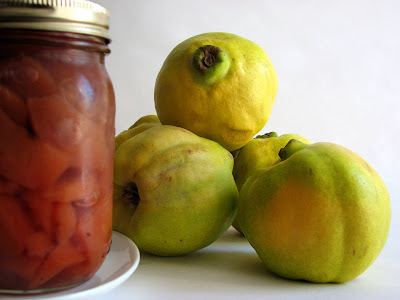 - I’ve substituted Cindy Mushet’s recipe for poaching quince from Desserts: Mediterranean Flavors, California Style. However, you may prefer to try the original recipe. 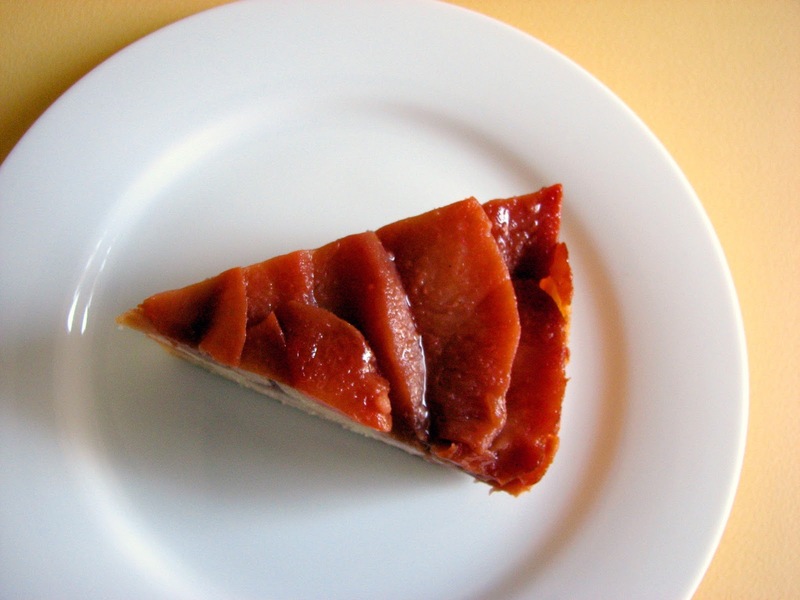 I also made additional quince because I wanted a higher fruit to cake ratio. - Although the process may seem a bit daunting, once you have the quinces poached you only need to complete a simple mix for a pound cake. The best way to do this recipe is to poach the quinces on one day and make the cake the next. - This cake is very dense and it took a freaky 1 hour and 13 minutes to bake. If I were to do this again, I’d probably make a couple loaves for smaller portioning and shorten the baking time accordingly. - Be careful when peeling and cutting into quince. They are very hard and will take steady but careful force. - Due to the high ratio of butter, it will take about 3 to 5 minutes before the butter and sugar are properly creamed. It won’t look right for the first couple of minutes but it will come together. - You can reduce the poaching liquid and serve over ice cream or mix into sparkling water or your favorite drink. Peel, quarter, and core fruit. Cut into 1/2” slices. Place the peel and the cores in a saucepan with the water, sugar, and flavorings. Simmer for 30 minutes. Strain and return the liquid, vanilla bean, and cinnamon to the pan. Add fruit and bring to a boil. Lower heat and simmer for 1 1/2 to 2 hours until the fruit is a deep rose color. Cool completely. Refrigerate in an airtight container. Preheat oven to 350°F. Prepare a 9- by 2-inch round cake pan with butter and flour and a parchment round. Place quince slices on a paper towel to absorb excess moisture. Cut into 1/4” slices or into smaller chunks if you prefer. Reserve poaching liquid for another use. Sift together flour, cinnamon, and salt twice. Beat butter and sugar until light and fully combined, about 3 to 5 minutes. Add eggs, 1 at a time, beating well after each addition and scraping down the bowl to be sure the entire mixture is creamed. Beat in half of flour mixture and then add all of cream until just combined. Add remaining flour mixture and vanilla, mixing until just combined. Fold quince slices into batter and spread batter evenly in pan. Bake cake in middle of oven 1 1/4 hours, or until a toothpick comes out clean. Cool in pan on a rack 20 minutes. Turn cake out onto rack and cool completely.